The UNIBLOC-PD rotary lobe pump has set the industry standard for high performance sanitary pumps. With the fully machined gearbox at its core, the UNIBLOC-PD’s compact design offers a solid foundation for reliability and durability in the field. Available in multiple sizes, the UNIBLOC-PD provides solutions for a wide range of demanding applications. The precision-engineered components deliver smooth, low shear performance while maintaining product integrity. Our signature seamless design and crevice free pump interior form the cleanest CIP/SIP capable pump in the industry. The UNIBLOC-PD line is the premiere choice in sanitary pumps. Precision Machined from solid stainless steel, the Unibloc Pump Head is the cleanest in the industry. The Seamless Design and Porosity Free Guarantee are standard features found only on Unibloc Pumps. The pump head interior and front cover have no pockets or crevices for product to become trapped, resulting in a fully CIP/SIP able design. Every Unibloc Pump Head features our VSM technology, allowing the pump head to fit any seal type. Unibloc’s patented rotor design offers the optimal efficiency and performance demanded in the field. Our engineers have created rotor designs that result in low product shear, and excellent displacement. Available in industry specific materials and designs, Unibloc Rotors lead in design and function. Oversized shafts are the backbone to the Unibloc-PD pumps performance. The short, robust shafts greatly reduce deflection at high pressures and lead to tighter tolerances, increased flow-rates and greater efficiency. More efficiency means slower operation speeds and increased life-span of components. Hardened and sleeved shafts available for increased durablility, faster maintenance, and decreased downtime. The Unibloc Gearbox is the toughest precision built gearbox in the industry. Its fully machined exterior is cleaner, smoother, and provides a non-stick surface for the ultimate in sanitary design. Our Helical Gears combined with Tough Taper Bearings gives the Unibloc Pump its signature smooth, quiet operation. For guaranteed pump and parts identification, the Unibloc Infinite ID is machined directly into the gearbox. No more missing tags or lost pump identification. 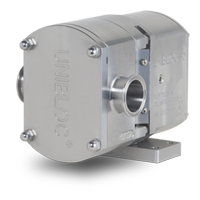 Unibloc Gearboxes are available in both Stainless Steel and Aircraft Aluminum.